Ilkley Moor01943 602319work Mountain or HillIlkley Moor is the perfect place not only to appreciate the panoramic views, but to also sample one of Ilkley's greatest attractions, its walking! Famous for the Yorkshire anthem "On Ilkley Moor baht 'at", the moor is also a Site of Special Scientific Interest due to its upland habitat for ground-nesting birds. Ilkley Quarry is also the site of the famous "Cow and Calf", a large rock formation consisting of an outcrop and boulder, also known as Hangingstone Rocks. The rocks are made of millstone grit, a variety of sandstone, and are so named because one is large, with the smaller one sitting close to it, like a cow and calf. 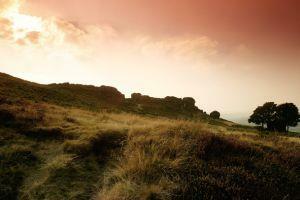 Ilkley Moor is the perfect place not only to appreciate the panoramic views, but to also sample one of Ilkley's greatest attractions, its walking! Famous for the Yorkshire anthem "On Ilkley Moor baht 'at", the moor is also a Site of Special Scientific Interest due to its upland habitat for ground-nesting birds.